Yesterday's full moon in Virgo was a special treat as it appeared larger thanks to a visual illusion on the horizon. Virgo moons are all about practicality, asking us to clearly think through common life situations and then tackle them to completion following methodical steps. Moons in this astrological sign are great for practical spell work, list making, cleaning, organizing and preparation. For this altar, I kept the circular mirror surrounded by pearls as representative of the moon. I replaced the gold and white flower candle holder from last time with a green one. Green is the color most commonly associated with earthy Virgo and represents healing, practicality and the northern element. 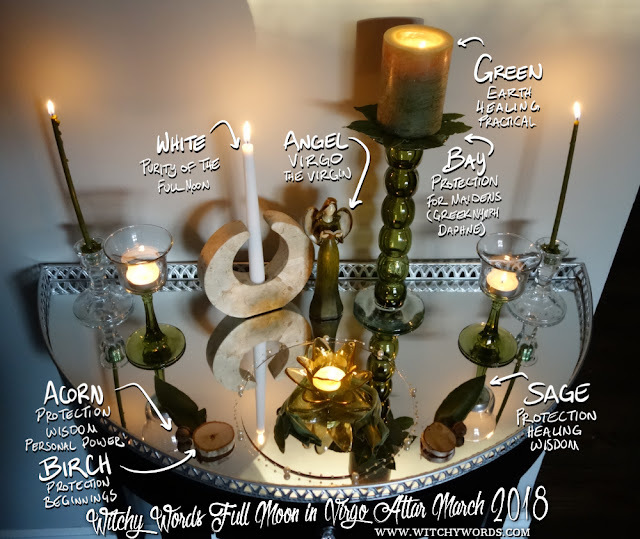 Around the green flower candle holder and on either side of the moon, I placed sage leaves. Virgo is represented by the "Virgin" or the "maiden," but I prefer to think of her as a practical warrior. Sage offers protection and healing, both qualities of Virgo and earth. Alongside the sage leaves next to the moon, I also added slices of birch wood and acorns. Acorns reinforce my interpretation of Virgo, emphasizing both protection and wisdom but also personal power. Birch corresponds with protection as well but also new beginnings. As we enter March and near the equinox, we begin to see the earth stir. Trees fill their branches with leaves, flowers bloom and the world is born. Birch represents this transition. Herbs, wood and seeds are, of course, earthy in nature and thus dear to practical Virgo. Virgo is often represented by an angel. Perhaps that's because a virgin is seen as "pure," but I prefer to think of it for Virgo's qualities of healing and soulful wisdom. Much like angels, Virgo is a nurturing protector, sensibly keeping a watchful eye on those whom Virgo loves the most. This statuette is the olive green color that is often associated with this sign and she's reading from a book. Perfect! Above the statuette, I placed a green candle on a bed of bay leaves. Bay lore takes us back to the Greek story of the nymph Daphne, whose father turned her into bay laurel to protect her from Apollo's unwanted advances. Bay is thus used for protection. That being said, this Virgo doesn't need anyone's help protecting herself and utilizes bay for her own work. Of course, for continuity, I kept my crescent moon candle holder and the same white candle. I fleshed out the rest of the altar with green tinted candles and candle holders. And, before putting this altar together, I took time to carefully clean not just the altar, but each individual component. Virgo is extremely organized, enjoying a tidy space. Every piece was not just spiritually cleansed but also cleaned with green cleaners! And there we have a full moon in Virgo altar! I'll leave you with an image dissecting the altar, as always. Enjoy! Thank you for this! As a Virgo I often struggle to build altars and find statuettes that appropriately symbolise that Virgo-ness. I love that angel, and that's she's reading a book. I used to use a flower crown for Virgo - representing earth with elements from nature, the sovereignty and doing-what-needs-to-be-done by the crown, and the maiden-ness by the flowers and their beauty. Thank you so much, Siobhan! I completely sympathize. It's a struggle to find appropriate representation for Virgo given what Virgo tends to represent. As a Virgo myself, I'm constantly clashing against that. That little angel statue seemed like the perfect fit, as does your flower crown!